“Food for the Gods” and a cocktail laboratory in a haute cuisine hideaway. With their trademark élan, the Klonarises used high-concept design in remodeling a Jackson Avenue antiques gallery to create the refined atmosphere of a Manhattan lounge. Contemporary pinpoint lights in ceiling panels provide dramatic pools of light, perfect for a romantic tête-à-tête. 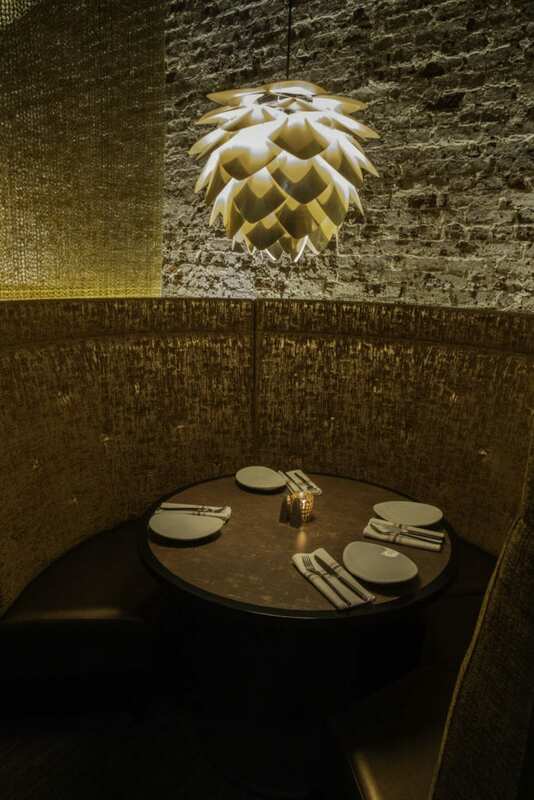 The exposed brick wall is lined with circular booths, each separated by gold chain and lit with Poul Henningsen-inspired layered shade fixtures which soften and spread the light. In the center of the dining area you’ll see the large Yin-shaped bar with plenty of seating. A dramatic circular glass shelf runs above the bar and allows the varied colors and shapes of the liquor bottles to become part of the decor. On the far wall, abstract impressionistic paintings by local artist Mark Carson English evoke Renoir’s Bal du Molin de la Galette. We must admit that we felt a little more sophisticated just being here. Members of the wait staff are both warm and knowledgable. They explain that much of the menu comprises small plates for tables to share and introduce the extensive, innovative cocktail menu. “Kefi is a cocktail laboratory,” explained Chazis, who also deftly described the highlights of the menu. The Greek theme starts out strong with Pikilia bread, with a sampling of three spreads, including several hummuses (try the spiced lamb and sumac, or perhaps the fava beans and wasabi microgreens), spicy feta (with chili peppers and herbs), muhammara (red pepper, walnut, and pomegranate molasses) and baba ghannouj (eggplant, tahini, olive oil). Saganaki—pan-sautéed kesseri cheese with fig and lemon, served flambé—headlines the cheese courses. The flames are entertaining and add the liquor’s flavor to the kesseri. Be sure to have Keftedes’ beef meatballs with creamy white tzatziki for a fresh take on this Greek classic. 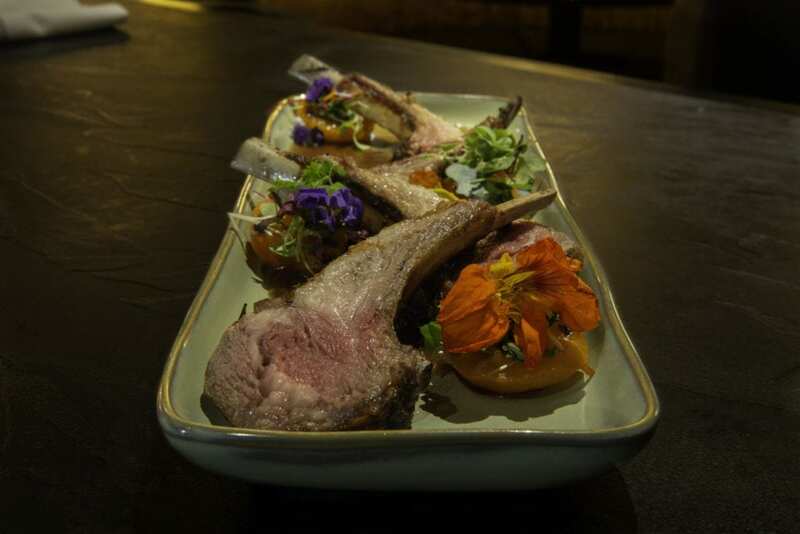 Our favorite was the Païdákia—roasted lamb chops served with grilled apricots and a tart cherry demi-glace sauce. They were tender, savory and cooked to a perfect medium-rare. Kokinisto, beef short ribs, is Kefi’s most-ordered and, at $40, the most expensive dish on the menu. The ribs are slowly braised in St. George wine sauce and presented atop fluffy feta polenta and garnished with roasted tomatoes and arugula. The are melt-in-the-mouth tender. You might complete the evening with a Greek Yogurt Bowl of fig, candied orange peel, chia seeds, toasted almonds, and tart cherry preserves, or with Kokakia, Greek cream puffs with chocolate glaze and raspberry sauce. From the blue flames of the Saganaki to the red of the roasted tomatoes paying homage to the Kokinisto short ribs, Kefi reaches for sophisticated ambiance, focusing on careful preparation and creative presentation. The prices are exactly in line with the aspirations of this restaurant. Sometimes you leave a restaurant thinking about the check, but we left Kefi dreaming of roasted lamb, kasseri cheese, and figs.